Architects dream about buildings that can change shape to suit varying environmental conditions, and constantly tinker with the technology necessary to achieve this. To this end, students at the Institute for Advanced Architecture of Catalunya (IAAC) have constructed a surface prototype that becomes flexible at temperatures over 60 to 70 degrees Celsius and starts to bend and contract to provide more airy space. Students Ece Tankal, Efilena Baseta and Ramin Shambayati at IAAC used Shape Memory Polymers to create a structure that changes its shape to adjust to varying ambient temperatures. They constructed the surface out of plywood which can become flexible when the origami-shaped structure’s surface reaches 60 to 70 degrees Celsius. Once it cools it can maintain the same shape and a new round of heating is required to contract it back to the original size and shape. 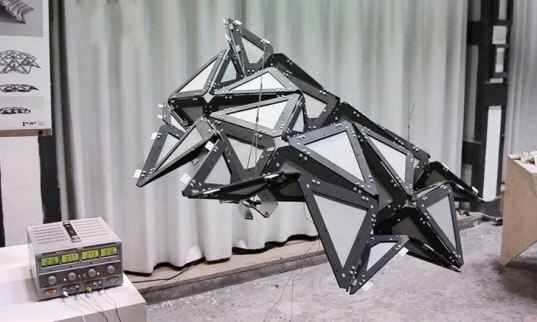 A form-finding process resulted in the decision to develop a foldable architectural system of triangulated tessellation. The hexagonal nodes were attached using a SMP joint system. In order to test the structure to temperature variations, the students introduced a parallel circuit connected to the embedded heat wires. A series of successful tests have proven the efficiency of the system and its possible applicability to actual buildings. Despite its imperfections, the project brings the practice one step closer to shape-shifting architecture that doesn’t require extra sensors or automation.